Aquantic Logie Fish Counters Ltd. The 2100C is shown below. It is electrically virtually identical to the 2100B/C (discontinued), but now has additional transient protection and a different enclosure, to comply with EMC requirements. 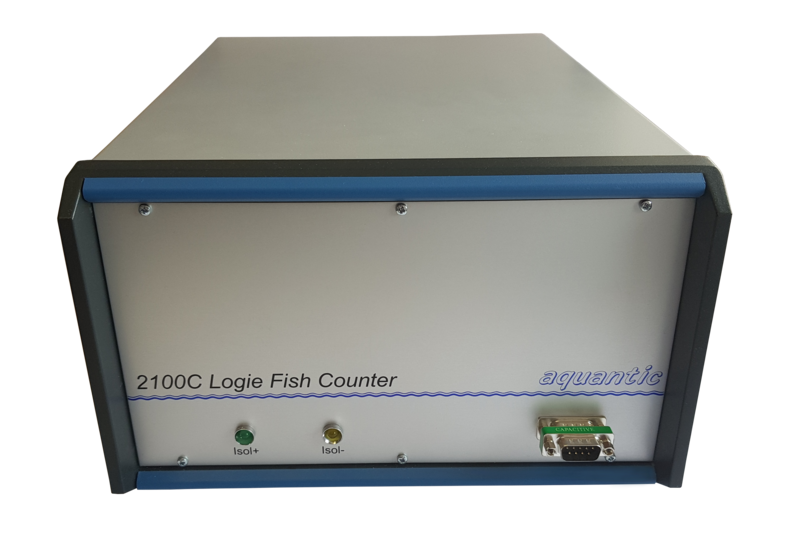 The UK List prices for the Aquantic Logie 2100C fish counter, can be obtained by requesting a quotation via email to rs@aquantic-logie-fish-counters-ltd.com The prices will vary, depending on the number of fish counter channels you require. An additional option for lightning protection for the Electrode Interface channels, can be added at an additional cost. There is a conductivity probe and environmental interface board available, again at an additional cost. This may be required, if the river water conductivity is low (<50uS) or if there are large changes in the conductivity in the river. To give additional protection against lightning damage, we can offer a panel fitted with 'instrument protectors'. For all price options, please contact rs@aquantic-logie-fish-counters-ltd.com where you will be provided with an up-to-date quotation. All software listed below for the 2100C will only work on the Aquantic Logie 2100BC fish counters. The Windows Control & Graphics programmes are relatively untried but please report any problems to rs@aquantic-logie-fish-counters-ltd.com and we will try to resolve them ASAP. The pdf files require Adobe Acrobat Reader in order to be viewed. If you do not have Reader installed, follow the link to Adobe on our links page. Right click on the above to download pdf file. © Aquantic Logie Fish Counters Ltd.